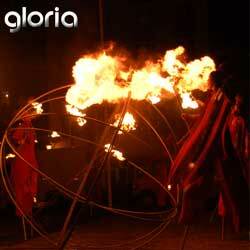 The play tells the story of the rituals and customs which accompany the mankind from its beginning. Theatre Voskresinnia shows what important role of fire in hyman life. Actors – creators of the Univers, by the sounds of artisticly played live percussion music, are a wedding procession, merry troupe of dancers and jugglers then to be suddenly transformed into knights of Revelation, who are making an annihilation.